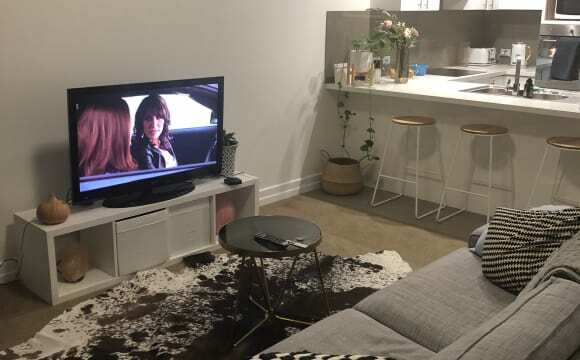 1 x current tenant looking for 1 x housemate. Air conditioned living room. Dishwasher installed. Loads of under house storage including lockable garage for 1 x small car. Quiet street close to restaurants, multiple shopping locations and train station/bus stops. House is furnished except remaining 3 x bedrooms. Pets welcome. No couples please. Cute unit, light, airy, open. Separate toilet. Shared bathroom. Great well equipped kitchen. Small hangout but cosy balcony with plenty of plants. Safe. Don’t watch TV so may suit someone who likes to watch tv in their room or not too fussed on it either. I work full time and uni and gym etc so pretty busy and out a lot....looking for someone similar looking for a chilled house. Excellent location, 5mins walking distance from Coles, Woolworths, Tennis Courts, Cafes &amp; Gyms. The property is modern, furnished and pet friendly, with aircon downstairs, a gas stove-top and ceiling fans in the bedrooms. There is a spare room for friends to stay and plenty of storage available. Move in dates are flexible. Bills to be aware of: Electricity &amp; Gas generally comes to $160.00 per person, per quarter. Internet is $20.00 each per month. Brand new, high quality studio apartments located in the heart of Morningside right next to Comslie Plaza Shopping Centre. Several to choose from, rent from $320/wk. Beautifully appointed, these apartments are fully furnished and self-contained with everything you need to move in straight away. Air conditioned for your comfort, key-less entry, loads of storage space, screens, ceiling fan, ensuite and kitchenette. Downstairs units have a courtyard and garden, upstairs units have a small balcony. Each property has 2 units downstairs and 3 units upstairs. No need to worry about connecting services as the rent includes electricity, water and communal internet!! Council and Fire regulations only permit 1 person per studio. Sorry no pets allowed. 4 Communal off street parking spaces. Perfectly located to transport (bus and train), cafes, shops, gyms, medical rooms, pubs and loads, loads more. Contact us to book your inspection now!! 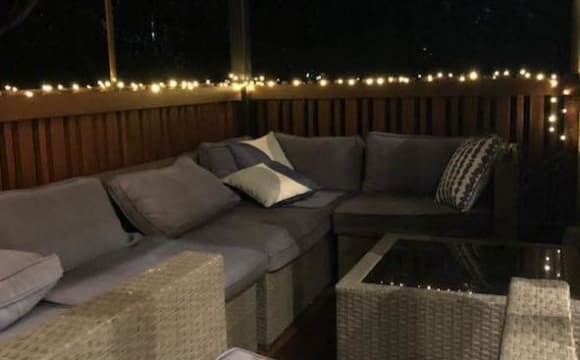 Beautiful apartment, fully furnished (your room comes with a bed and desk) I am super close to Coles, Woolworths and public transport. All bills included so all you’ll need is yourself and your suitcase. Fully furnished 4 bedroom plus study, 2 storey house with lock up garage. Lots of storage available. Big yard, with one dog and would consider more dogs. Room is unfurnished with built in closet. House has unlimited internet, Foxtel, gas and electricity, not included in rent. Quiet street, close to shops, buses and train stations. Modern 2bed / 2bath unit on the top floor (three levels), with a beautiful big balcony and 180 degree views. Ducted aircon, internet, Netflix &amp; Stan. Fully furnished - just bring yourself! Also clothes. 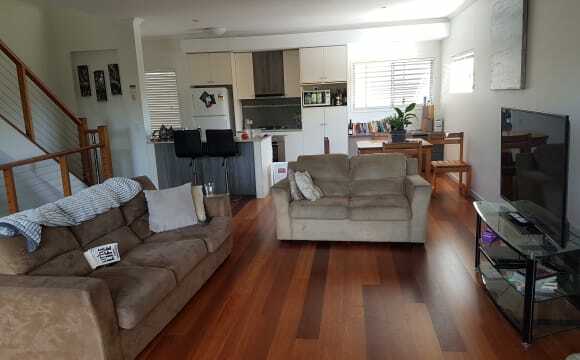 Super close to trains, busses, and Nandos (all the essentials) NB: the actual furnishing of the house is different now - I just pulled these photos from the realestate site when I bought it. Very new, spacious townhouse and great location. Air conditioned common area downstairs. Shared bathroom with one other girl but it is kept very clean. Super close walking distance to the supermarket, gym and bus stops to the city. 5 minute drive from Hawthorne/Bulimba Ferry stops. Available now 😊 Big and spacious 3 bedroom, 2 bathroom townhouse which is set over 3 levels. Really nice balcony for entertaining and duct air conditioning throughout. Convenient location, close to shops, cafes, gym and bars. Oxford st is only a km away. Ability to walk to buses (city and southbank) and train station. 1 room available. Unfurnished with inbuilt waredrobe and can fit a king size bed (room dimensions 3m x 3.2m). Townhouse is fully furnished, so ideally you just need to furnish your room. Shared bathroom. I own a dog. 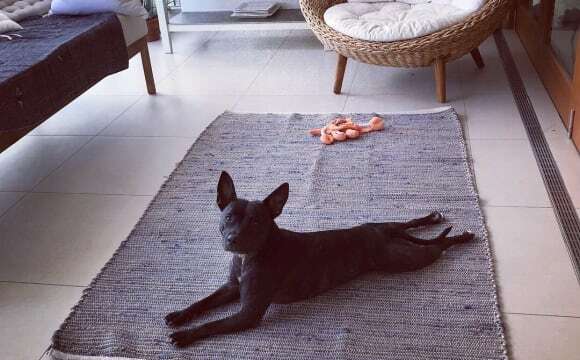 So hopefully you are dog friendly 😊 Rent + bills (split evenly) Bond is 2 weeks rent. Hi Guys and Girls! I am looking for a responsible down to earth person to join me in my beautiful townhouse in Morningside! 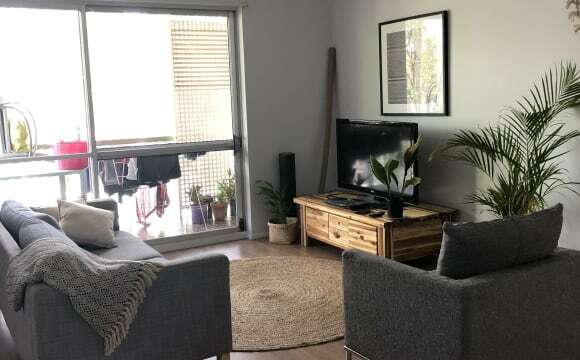 The flat is extremely tidy and comes furnished with all the basic ammenities including TV, Washing Machine, dining room table, Xbox one, Netflix etc. So you just need to bring your own room furniture. You’ll have your own upstairs bathroom. The flat comes with an off street park as well if you have a car, if you don’t the place is a 2 min walk to the train station and 5 minutes to the Morningside shops. This property is located only minutes to bus stops, train station, ferry terminal, close to city, airport and shopping centres. Beautiful breezy apartment, with views. Good size bedroom with reasonable size wardrobe. Will have own bathroom. I have all house furniture, All you need is yourself and bedroom furniture. Sorry no pets allowed in building! Would prefer a non smoker too! Our house is fully furnished and open plan with air-conditioning downstairs. 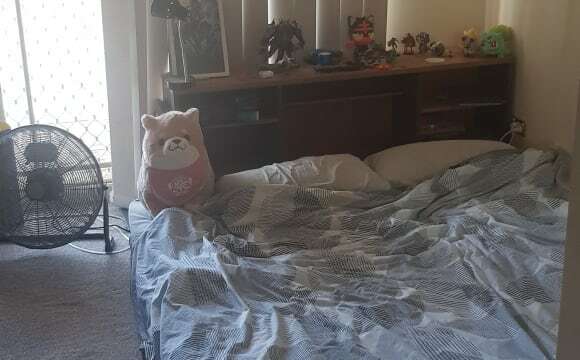 You would be sharing a bathroom with my housemate (I have an ensuite), there’s a dishwasher in the kitchen, water is included in the rent, and the room comes furnished with a double bed and bedside table. There is also an inbuilt wardrobe for clothes and storage. Bond is $600, internet is $20 a month, and our quarterly electricity is roughly $150. Air con, good kitchen, balcony next too bedroom and enclosed space opposite from the kitchen. Our place, cosy enough for you to call home, close to Morningside train station and bus stop. The house has tall ceilings, timber flooring, downlighting and ducted air conditioning throughout. It has a large, open plan kitchen featuring, stainless steel appliances and island bench, leading to a large balcony with BBQ. Your room is downstairs, in a private setting, facing a Poinciana tree-lined secure backyard. It can be un/furnished with any size bed and has mirrored built-in robes. 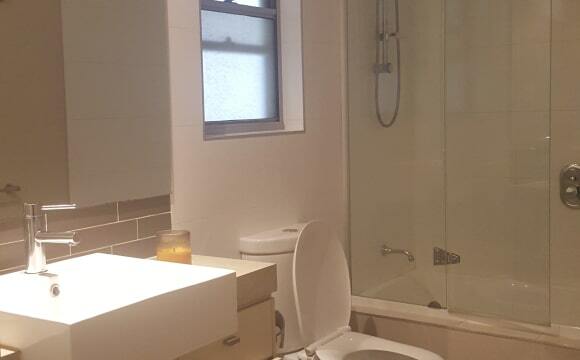 The private bathroom has a shower over bath. Additional features in the home include Internet (included), a double car garage which can be negotiated, crimsafe-security screens and windows, and plenty of spacious storage areas. 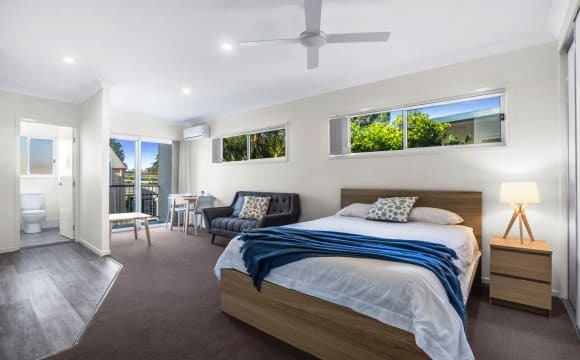 It is easy walk to/from shops, parks, Hawthorne cinema and cafes, also 5-10min drive to schools, to Brisbane River and all the trendy cafes and shops on Oxford Street, Bulimba, Southbank, or the CBD. If interested and you need further details please contact us asap. I think clean and quiet.